Now I have to say that at the start of this book I was pretty keen on it and hooked. I had loved watching Gravity and I thought that James Smythe’s The Explorer was a bloody marvel and I am not known for my love of books set in space. So I had high hopes. As Mark starts to look at ways to survive, both using the kit he has and also his bodies natural matter and chemicals, I was initially fascinated and even laughed a lot (there was a lot of poo being used as manure to grow plants science, thats my kind of science) as it went on. Then I started to get really, really, really bored. I even beefed up the MAV fuel plant compressor. It was very technical (I increased the voltage to the pump.) So I’m making water even faster now. After my initial burst of 50 liters, I decided to settle down and just make it at the rate I get O2. I’m not willing to go below a 25-liter reserve. So when I dip low, I stop dicking with hydrazine until I get the O2 back up to well above 25 liters. Important note: When I say I make 50 liters of water, that’s an assumption. I didn’t reclaim 50 liters of water. The additional soil I’d filled the Hab with was extremely dry and greedily sucked up a lot of humidity. That’s where I want the water to go anyway, so I’m not worried, and I wasn’t surprised when the reclaimer didn’t get anywhere near 50 liters. I get 10 liters of CO2 every fifteen hours now that I souped up the pump. I’ve done this process four times. My math tells me that, including the initial 50-liter bust, I should have added 130 liters of water to the system. Well my maths was a damn liar! I mean seriously, it’s really dull, really repetitive and really boring. You could say ‘Simon that is the point’ but if you did I might have to come and poke you in the eye. Even if it is boring or complex science, and even if Mark must do it over and over again there is no excuse to be boring, the aforementioned Mary Roach is never dull not once, she gets me to understand science by making it funny, a bit rude, interesting and exciting. 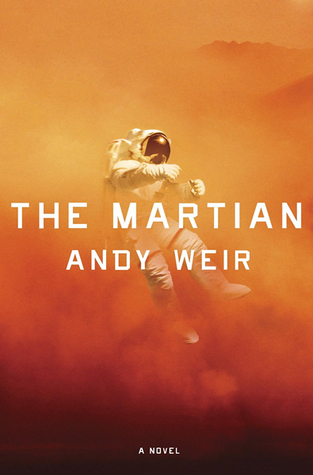 However Andy Weir is not Mary Roach, actually that’s not fair, Andy Weir’s narrator Mark is not Mary Roach. After a few chapters I realised Mark is actually a cocky, arrogant, self inflated twerp. I hated him and the science. Then it went downhill further for me when we joined the spaceship heading back to earth. “How many back up communications systems does an Ares mission have?” Venkat asked. Now if you haven’t fallen asleep again and found that tedious to read, imagine how it was to have to type it all. I mean me, not the author. Please bear in mind that this was almost a page of the book where absolutely nothing happens, no real movement goes in the story and things are (ironically) once again repeated over and over and over. If only it was ironic enough to be funny, it’s just infuriating. There are endless pages like that, well how as endless as fifty pages can actually feel and I was getting more and more and more angry. So why had I not stopped reading? Self trolling maybe, seeing how much I could take (I did the same with Fifty Shades of Grey) before my eye bled and I hurled the book across the room. Whatever it was I was utterly broken when they started to introduce women into the book and a whole level of misogyny was introduced as the female characters were. Girls are either clever and bland looking and not really paid much attention in the book, or they are astronauts wet dreams. I think at one point I read something along the lines of but you’re too pretty to be an astronaut. That was it, I was done and frankly utterly furious. I threw the book across the room and gave up. So as you might guess I didn’t like The Martian very much, I thought it was utter bobbins if I am honest. I had such high hopes for it, especially after hearing all the right people loving it. Interestingly Gavin, Kate and Rob and I all read this for Hear Read This and we all hated it, yes even Gavin, you can hear us giving it a good bashing here. That said, I am also aware we are in a small minority, after all there is a multimillion pound movie being made with Matt Damon in it, so it must be good. I won’t be queuing to see it though. I will be reading the sequel to James Smythe’s The Explorer, called The Echo, instead. If you want a corking spaceship book please, please read that instead. There I’ve said it. If you have read The Martian I would love to hear your thoughts be they the same as me or be they that you think I am a complete buffoon. Do let me know. I was the same with Mr Penumbra’s 24-Hour Book Store by Robin Sloan which almost everyone else in the world loved too.